Historians say Trump's trip to Europe smashed the conventions of American leaders on the world stage. He criticized NATO, Germany, British PM Theresa May and the EU at different points throughout the trip. His summit with Putin was particularly stunning, as he made comments undermining American intelligence agencies. Plenty of U.S. presidents have created commotion in their travels abroad, but none as much as President Donald Trump. The president's tumultuous trip across Europe, historians say, smashed the conventions of American leaders on the world stage. Trump's "America first" approach to foreign policy had him seeming to accept the word of a hostile power over his own intelligence agencies, insulting allies and sowing doubts about his commitment to the NATO alliance. "We've never had a president go abroad and not only lecture to our NATO allies, but also to embarrass them," said Russia expert William Pomeranz, deputy director of the Kennan Institute at the Wilson Center. "We've never had our president go on a foreign tour and categorize our allies as foes. And we've never had our president hold a joint news conference with a Russian leader where he assigned blame, from his perspective, to both parties, but in fact dedicated most of his time to blaming the U.S. Justice Department and intelligence services." While past presidents have had difficult foreign trips and been criticized for their summits with Soviet leaders, Trump's behavior has few parallels, in the view of presidential historians and longtime Russia watchers. Franklin Roosevelt was accused of "selling out" to Joseph Stalin at the Yalta Conference in 1945; John F. Kennedy and his aides admitted that he'd been unprepared for his 1961 Vienna summit with Nikita Khrushchev; the Reykjavík summit between Ronald Reagan and Mikhail Gorbachev in 1986 was seen at the time to have ended in failure; and George W. Bush was mocked for telling reporters in 2001 after meeting with Putin that he had "looked the man in the eye" and "found him to be very straightforward and trustworthy." "Frankly, I don't think those U.S. presidents at any point came off as not pursuing U.S. security interests, as being taken in by the Soviet leader they were meeting with," said Alina Polyakova, a foreign policy fellow at the Brookings Institution. "I think even President George W. Bush's meeting, where he had that famous quote about looking into Putin's eyes and seeing into his soul — this summit dwarfs that by a factor of a thousand." Indeed, even before he departed Washington, Trump had made clear that he was itching for a fight. 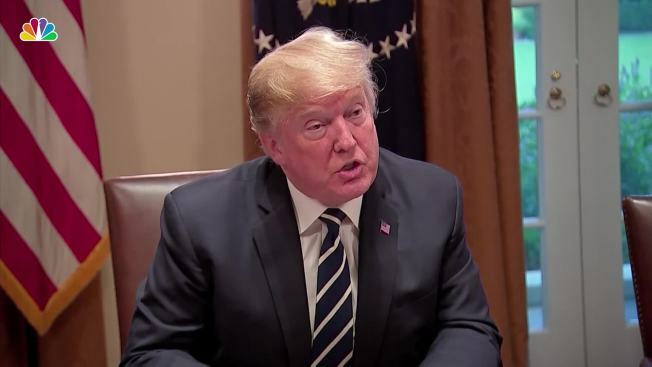 He criticized members of NATO, the decades-old military alliance, for failing to spend enough on defense and suggested he might not be interested in "paying for Europe's protection" any longer. 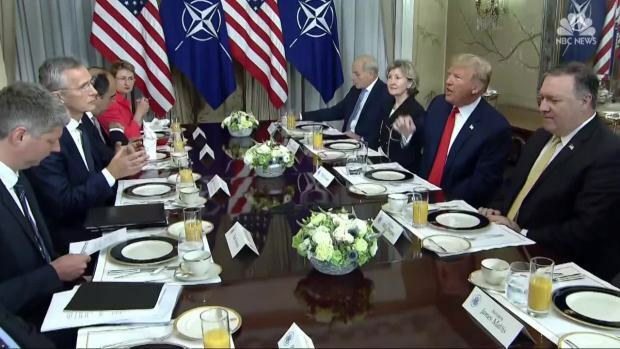 In his first appearance at a pre-summit breakfast in Brussels, he went after German Chancellor Angela Merkel, claiming Germany was "totally controlled" by Russia and later asked on Twitter, "What good is NATO." The summit ended in a whiplash-inducing proclamation from the president that NATO was stronger than ever as he claimed he'd secured new commitments to defense spending, which those present later disputed. The drama continued as Trump headed to his next stop, the U.K. His first official visit was overshadowed by fallout from the rhetorical grenade he'd lobbed at British Prime Minister Theresa May before arriving. In a tabloid interview, he criticized May's Brexit plans, said he might no longer be open to a trade deal with the U.K., and said one of May's political rival would be an excellent prime minister, undermining her at a time when her government is in turmoil. Then came yet another interview, this one from one of his golf courses in Scotland, in which Trump categorized the European Union as a top geopolitical "foe." Nothing, however, had quite prepared the world for Trump's comments in Helsinki after hours of meetings with Russian President Vladimir Putin, whose government, U.S. intelligence officials have concluded, meddled in the 2016 election, hacked Democratic Party emails and disseminated them in an effort to help Trump win. Standing side-by-side on stage with the man accused of complicity in an attack on the very bedrock of American democracy, Trump said his intelligence people "think it's Russia. I have President Putin. He just said it's not Russia. I will say this I don't see any reason why it would be." He also went after his Justice Department, calling its investigation into Russia's efforts and potential collusion with Trump's campaign a "disaster for our country." "Trump 0 - Putin 1," blared the front page of Finland's Kauppalehti newspaper. 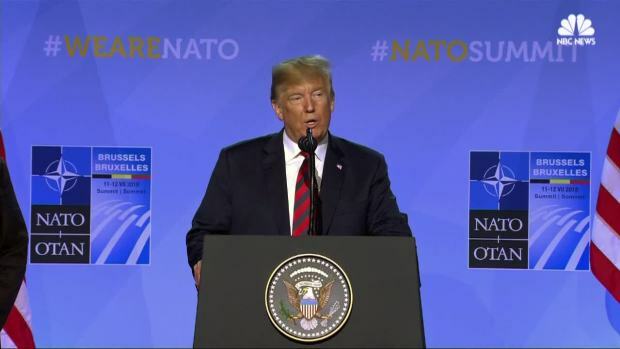 Speaking to reporters, President Donald Trump said Thursday after a two-day NATO summit in Brussels that it would be "unnecessary" for the U.S. to withdraw from NATO because his allies agreed to boost their military spending. Douglas Brinkley, a presidential historian and professor at Rice University, compared Trump to "a bull carrying his own china shop around with him." "Just standing and selling your country downriver on foreign soil in front of your adversary — there's no precedent for such disgraceful and irrational behavior," Brinkley said. Pomeranz said Trump had done himself political damage by suggesting both sides were to blame for the Russia probe that has hurt U.S. relations with Moscow — just as Trump did when he blamed both sides when responding to violent white supremacist protests in Charlottesville, Virginia. Pomeranz said the damage Trump did by describing the E.U. as a foe and lecturing his NATO allies was significant. "I think that is what's going to be remembered from this week," he said.